The FHA loan is the most popular loan program for first time home buyers. Borrowers can take advantage of down payments at little at 3.5% on a 30 year fixed rate program. FHA loans are popular for many reason, but some things people like the most is the flexibility of no pre-payment penalty, easy to utilize gift funds, multifamily properties are ok! even funding for rehabs on owner occupied fixer uppers (FHA 203K). If you are looking to use an FHA loan on a single family detached home, you're in luck! They do not need to be approved by FHA like condos and townhomes do. Please click here to search for detached single family homes. If you are looking to use an FHA loan for a condominium or townhome we have made it easy for you. Click on the links below to view all the FHA approved condos and town homes by region across the county. SAN DIEGO CENTRAL FHA CONDOS: Talmage/San Diego Central, North Park, Mission Hills, East San Diego, Golden Hill, Linda Vista, Encanto, Lemon Grove, Logan Heights, Normal Heights, Paradise Hills. 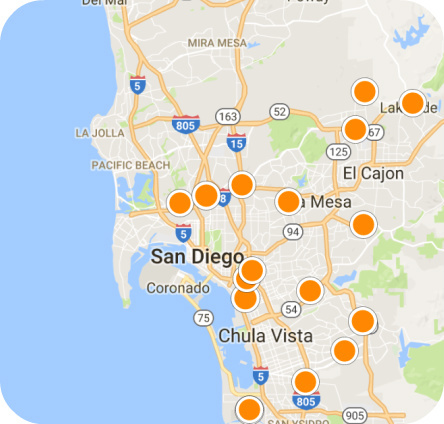 SAN DIEGO COASTAL FHA CONDOS: Clairemont/Bay Park, Coronado, Downtown, La Jolla, Mission Valley, Ocean Beach, Old Town, Pacific Beach, Mission Beach, Point Loma, Sorrento Valley, University City/UTC.